If you need towing services in Washington you can call us, and CONSIDER IT DONE! REQUEST A TOW ONLINE NOW! Towing Service You Can Rely Upon! The towing professionals at Skyway Towing & Recovery are highly-trained and qualified and guaranteed to provide you with an unrivaled level of customer service at fair cost to ensure your vehicle is towed and cared for in the best possible manner irrespective of emergency or otherwise. 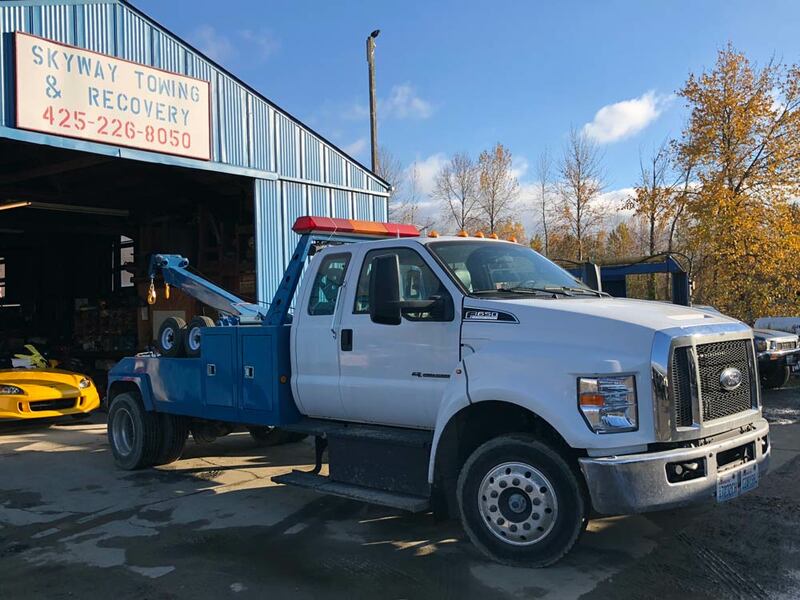 Skyway Towing & Recovery is a leading roadside assistance provider in Seattle, WA dealing in 24 hours towing, tire change, impounds, and tow truck services for everything from small cars, and light vehicles, to semi trucks, and RVs. we have enough trucks and staff to deal with heavy-duty towing, like cargo, tour buses, motorcoaches, containers, other heavy duty equipment, and more. We offer complete towing services in Seattle, WA, including commercial towing, emergency towing, impounds, and more. Commercial towing:– Our fleet division can cater to your specific needs, saving your time stuck on the roadside with no help. Skyway Towing & Recovery is just a call away! Emergency towing:– We provide 24-hour emergency tow truck service & roadside assistance for unexpected circumstances in a stranded location inside Washington. Roadside assistance:- From roadside assistance tire change to jump starts, and lock-outs – we have equipment and skills to tow everything, including the heavy trailers and machinery. Impounds:- No more messing with vehicles parked on your private property despite the notice. Get help from our impound team to tow away unauthorized parking in your private property. At Skyway Towing & Recovery, we will connect you with our team of professional drivers who have been working in the towing & recovery business for years. We offer the most competitive and cheap rates in the local towing industry in Washington. Our team of courteous and trained drivers, a well-equipped fleet of 20 trucks, and proven industry experience make us the leading choice of towing truck service in Kent, Seattle and adjacent regions. Excellent service at modest rates. We also provide equipment transport, specialty vehicles, and flatbed services & more apart from our regular line of services. Check out our service category to find towing solution for your specific needs. Skyway Towing takes pride in customer service and satisfaction. We offer a fleet of over 20 trucks ranging from light, medium and heavy duty tow trucks. Our drivers have multiple years of experience and multiple levels of training. Skyway Towing was established in 1960. We are family owned and operated and have been taking care of all our communities towing needs over the last 56 years. There is no job too big or too small, we take care of it all. We operate one of the largest fleets in South King County and Seattle metro area. We hold exclusive government and all local law enforcement contracts. We are here to serve your needs! We operate in all 49 states including Canada and Mexico. Skyway Towing takes pride in customer service and satisfaction. We offer a fleet of over 30 trucks ranging from light, medium and heavy duty tow trucks including our 60 ton rotator. Our drivers have multiple years of experience and multiple levels of training.